Michael Leckie Studio Architecture + Design Inc. The project started with a simple question: How do we design a house that will last a hundred years or more, and accommodate multiple generations of family members to grow up and grow old together? Full House is a multi-generational housing typology developed for a Vancouver site. While this particular project is a contextual response to the economic, social and urban conditions of this specific place, urban centres across Canada are experiencing skyrocketing real estate prices and, consequently, a general increase in the number of adult children living with their parents. In Vancouver, the average selling price has now surpassed $1,800,000 for a detached house, $850,000 for a townhome and $650,000 for a condo unit. As a result, multi-generational living is the only viable home-ownership option for many families. 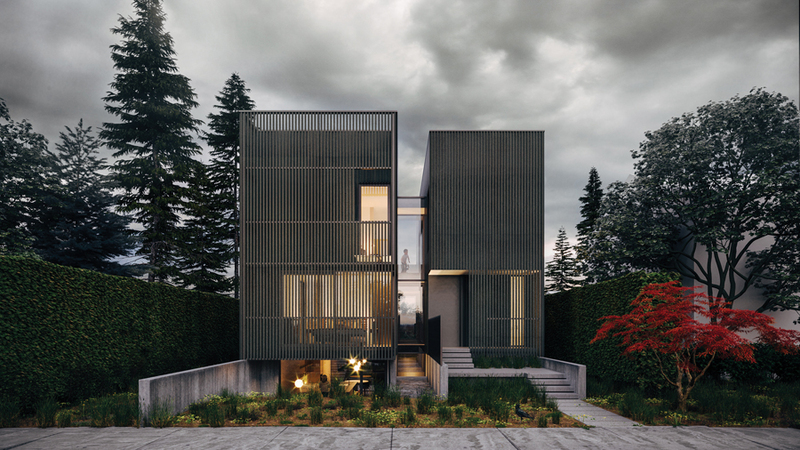 The project is conceived as a five-bedroom home with a detached one-bedroom laneway dwelling. The home is reconfigurable to operate across a variety of traditional program scenarios through the orientation of a pivot door —inspired by the famous 1927 photograph of Marcel Duchamp’s door at his studio at 11, rue Larrey in Paris. The device is a pivoting steel plate partition that can occupy three possible positions; adjusting the position of the door alters the architectural programming of the suites in the house. Regardless of whether the situation is a matter of choice or financial necessity, the benefits of multi-generational living are becoming widely recognized. These include financial support, readily available childcare to provide mutual benefits for young and old, less physical and emotional isolation for aging grandparents, and emotional bonding and closeness across generations. These emotional, physical, and financial benefits are experienced by all family members. Adult children living at home can save money while going to school or working. Older family members can find an enriched sense of purpose and meaning by spending time with young children, and the demands of keeping up with kids —both physically and intellectually —helps grandparents stay active and feel younger. The benefits to grandchildren include learning empathy, care and respect for elders, as well as social skills through role-modeling. Shirley Blumberg :: An innovative and elegant solution to a fairly complex problem: designing housing in a way that is flexible and reconfigurable to accommodate changing needs over time. Very thoughtful and imaginative. Jack Kobayashi :: With one swing of a door, this project resolves three different housing scenarios in one building. It’s an extremely well-considered design throughout. The design starts with a housing lot, originally intended for one household, and shares it among four. The design makes a contribution towards resolving the housing crisis occurring in most major urban areas without up-ending the equilibrium of low-density living. Steve McFarlane :: The jury was given several beautiful houses to consider this year, but this one stood out because its inventive morphology reaches well beyond the confines of the particular site. Clever and thoughtful spatial arrangements support an architectural slight-of-hand, addressing the nuances of collective and individual dwelling with the click of a single latch.